How bizarre to imagine that the oil you use every day to flavor your food, represents a highly effective solution in protecting your sensitive skin. When choosing an oil that comes into close contact with your skin, the important thing is to choose natural and cold-pressed ones, because the refining process impoverishes oils of vitamins and phytosterols. Also, make sure you read the ingredients, because what you put on your skin must respect its sensitivity, and enhance its beauty, elasticity and strength. Obtained by cold pressing olive pulp, olive oil has a characteristic odor and ranges from a golden yellow to green color. One of the richest in oleic acid (about 62%), olive oil boasts great nourishing and emollient properties for the skin. In addition to oleic acid, olive oil contains about 15% linoleic acid, 15% palmitic acid and 2% stearic acid. Olive oil has a significant concentration of active antioxidant ingredients with restorative, anti-inflammatory action and squalene, one of the main components of the surface of the skin. Its nourishing, soothing, emollient and antioxidant action protects the epidermis from external aggressions such as cold, wind and sun. Another definite plus in addition to its organic properties, olive oil has a low average cost and may be stored for several months at room temperature, in a dry place away from heat and light. Olive oil is a rich emollient oil that deeply nourishes the skin and regulates its natural hydration system. Well tolerated by even the most sensitive skin, olive oil has a soothing effect on redness and irritation. Effective in hydrating dry skin: Often used for the treatment of irritated or chapped skin, it may be used as a lip balm or hand oil to moisturize dry skin. Soothing for sensitive skin: It is also very effective in treating eczema, psoriasis, and herpes. Pair it with other essential oils: Olive oil may either be applied in its pure form or mixed with other essential oils such as lavender to enhance its hydrating effect. To avoid that skin remains greasy after application, it is advisable to mix it with a more penetrating oil, like that of Macadamia. Anti-aging effect: Try replacing your eye contour cream with olive oil. Apply a few drops overnight and you will notice the difference in a few days. 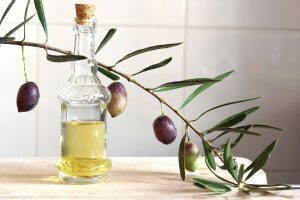 A traditional ingredient in organic products: Olive oil is an essential ingredient of moisturizing creams for hands, face and body, in lip balms, hydrating body products, and bath and massage oils.